Midousuji's team gathers at the front to challenge Hakone while leaving Sohoku behind in crisis. It was about time we started to see how Imaizumi has progressed since last year and the first thing to test is how he does against Midousuji's mental games. Unfortunately, it looks like Midousuji has increased his skill level at those things too. The two most important things Imaizumi remembered from Kinjou's advice was "face yourself," and "face reality." 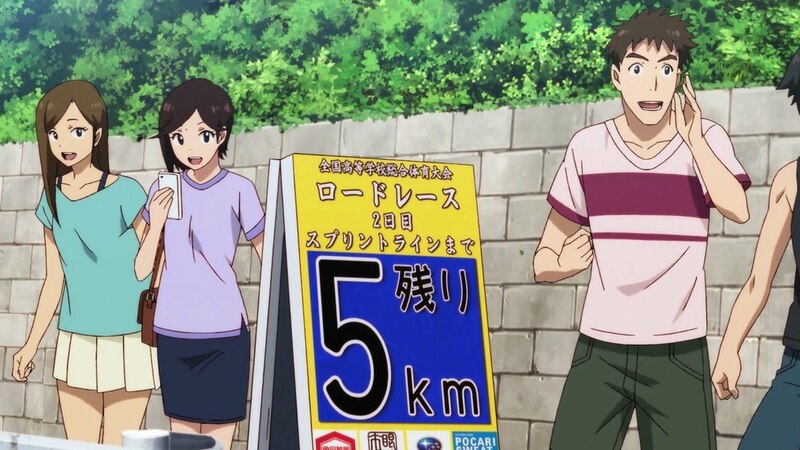 From his conversation with Miki at the bike shop, it appears that Imaizumi didn't really pay attention to his psyche, where he felt limited in his time because of his added duties as a mentor. The things he should have done was talk to Teshima more about his personal goals and responsibilities, to be more openly "selfish" to his teammates, instead of only opening up to his childhood friend. He left a gap between himself and his new teammates. Imaizumi trusts Naruko and Onoda with no doubts whatsoever. You didn't see him get mad at Onoda for staying back and dragging Teshima up the rest of the climb. He got mad at Teshima for not recovering quickly enough to enact the plan he had made on the road. Imaizumi also didn't get mad at Naruko for going on ahead. Instead, he praised him for making the right choice. Imaizumi's improvised plan failed and he cracked. This dovetails nicely with the second thing Kinjou told him, "face reality." He heard it enough from the seniors from last year, that things always fall apart on the road. This is why Sohoku's team spirit is about riding together. If you're all together, if one guy can't find a way to fix their adverse situation, someone else will. You don't just get one chance to get back to the front. You have to make your chances. Midousuji's digs at Imaizumi are general purpose, but if there is a crack somewhere, those questions can find a way to ooze inside. Imaizumi may have strengthened himself so those psychological attacks don't cause self-doubt, but they could cause Imaizumi to doubt his teammates. He's getting mad at himself for not knowing how weak Teshima, Aoyagi, and Kaburagi are, but this also means he's not facing the reality of how strong they are and how things unfolded on the road. He needs to face reality and make another plan to put the team back into a winning situation. Nice tongue wagging there, Midousuji. Midousuji is still playing those mind games. Teshima finally caught up to the other guys. It looks like he wasn't waiting for anyone. Nice flashback at the Kanzaki bike shop. Imaizumi and Miki are totally OTP. There's way too much second guessing going on in Imaizumi's head. Midousuji's digs got to him. Naruko is still tagging along at the front. Har. Midousuji calls Izumida "eyelashes" too. Ooh. Izumida wants revenge for Shinkai. And he's zipped up already! Look! Girls! At the 5 km to go for the sprint line, that is. Hoho. Izumida got Doubashi to brag on him and Midousuji called him out on it. I love the banter between these two. Izumida wants to stretch his abs, er, legs. No, abs is correct! Abu! Bua! Of course! Komari wants those muscles! He is totally the fujoshi self-insert character. Um, he did not have to go through the sleeve to get to Frank. Kuroda has good instincts, but he's also overprotective of Izumida. Yes, obviously Komari does something with the feelings he gets from, er, feeling up those muscles. *shudder* "Does something." Stop sniffing your hands, Komari! Izumida is solid. He wants data on this Komari cipher. Hahaha. Komari is panting from looking at those muscles flex! Calm down, fujoshi! Frank senses danger. And now Komari is on Izumida's right side. He's going to try for Andy before this sprint is over. Ha. This omake is great. Kuroda is just like Arakita with getting no love from this black cat. Another new end card. Every week? Or just until the next half begins for Spring? With the three favored teams battling at the front, we now get to see all their bikes. We got De Rosa, Pinarello, Carrera, Anchor, Scott, BMC, Cannondale, and BH. Tactically, the only thing to talk about is how Imaizumi went to the back of his group because he had given up on catching the front of the race. However, if he's no good at pacing other riders, which is bad for a team sport and especially since he was a leadout man, then the best thing is to sit in the back so he doesn't cause gaps. I suppose Imaizumi was so spoiled with Kinjou as his ace that he never had to worry about him losing his wheel. First it was that Hiroshima guy, now it's time for Komari to get a feel of Izumida's muscles. The blue-haired freak never ceases to amaze me. Kyoto and Hakone were so fun to watch this week that I didn't even feel bad for Sohoku's struggles. I hope Hime Hime is enough to save them. Some of the voice actors don't sound like they're having much fun, but you can never go wrong with the Midousuji or Teshimas versions. Oh, and Ishigaki's committed performance truly makes me miss the character. Ha! That youtube video was great. I hadn't heard that! The personalities totally matched the performances, so I was not surprised at Toudou and Midousuji hamming it up. But dat Teshima! He always went to karaoke with Ashikiba, so there you go. I liked Naruko's and Tadakoro's energy too. Those confident sprinter types have no shame. Shinkai was solid too and obviously Manami is going to sing in a way to make the little girls swoon. Ah, that whole thing was great. Thanks for that!